For more than 35 years, Aga Khan Foundation Canada has brought the best of Canada to the world to change people’s lives for the better. From the very beginning, volunteers have been at the heart of our work. In the early 1980s, a group of visionary, men and women from the remote, high mountain areas of northern Pakistan came together voluntarily to form village organizations to lead the development of their communities. On the other side of the globe, a group of women in Vancouver came together in 1985 to raise funds to fight global poverty. All had come from Africa or Asia and wanted to give back to the communities they left behind. They persuaded 1,000 other Canadians to join them in a walk—and raised $55,000. Today, with the support of a longstanding partnership with Canada, those communities in northern Pakistan have made remarkable gains in poverty reduction, improved health and education, and expanded social and economic opportunities for women and men. 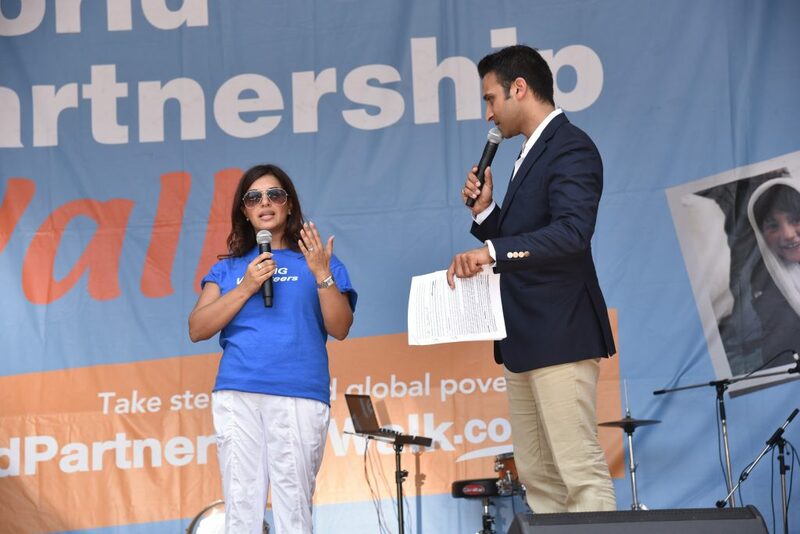 And in Canada, that first walk grew into a national movement with tens of thousands of Canadians each year raising funds and awareness to fight global poverty. As well, AKFC has many ways for Canadians from coast-to-coast to make a difference—from a volunteer speaker bureau, to a unique visitor program in Ottawa, to annual golf tournaments in seven cities. Yasmin Nathoo is the Regional Donor Services Chair for Quebec and the Maritimes – a 30-year veteran with AKFC. 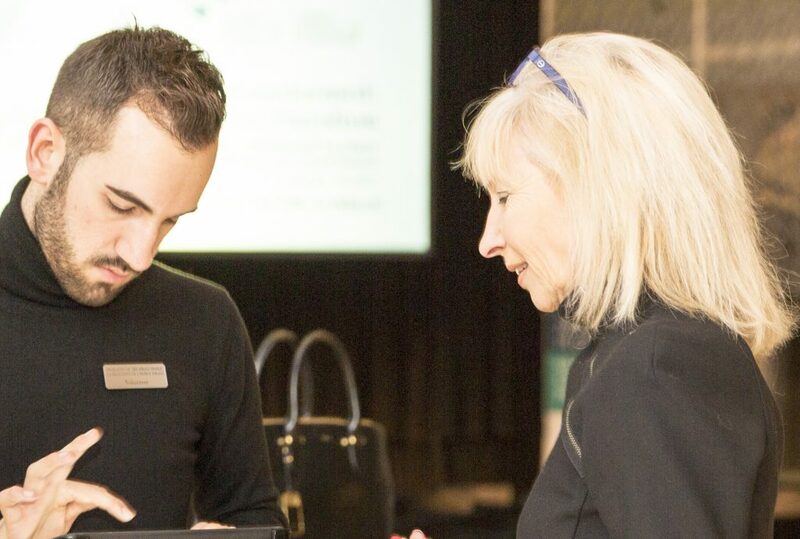 While pursuing his studies at the University of Ottawa, Angjelos Fero volunteers as a Visitor Program Guide, at the Delegation of the Ismaili Imamat. 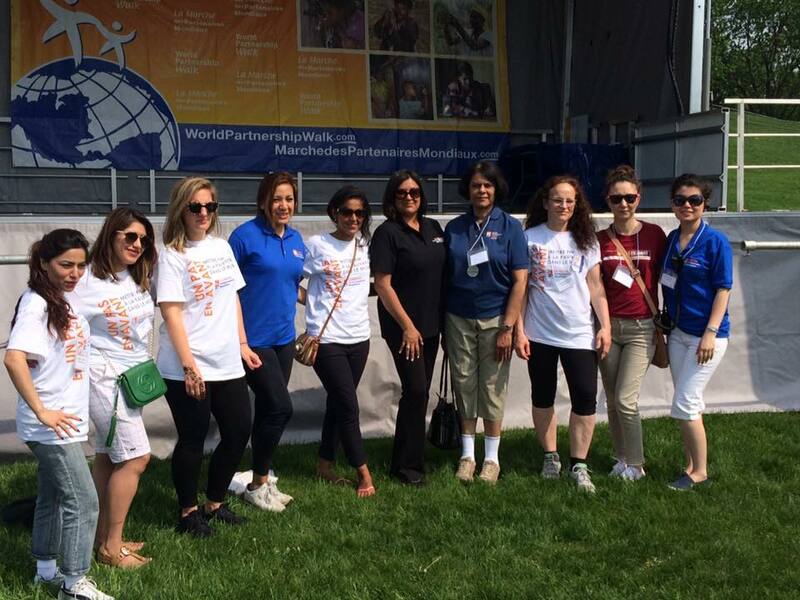 Farah Bundeali has volunteered for several years as a World Partnership Walk Workplace Team Captain at KPMG in Toronto. AKFC: What inspired you to become a volunteer? Yasmin Nathoo (YN): After almost 30 years as a volunteer for AKFC, I simply keep going and going, just like the Energizer Bunny in the advertisement. My source of inspiration is rooted in the ethic of our faith to render assistance to those who are less fortunate. Being part of the Donor Services team enables me to fulfil this noble calling. Angjelos Fero (AF): I am incredibly intrigued by the space of the Delegation of the Ismaili Imamat itself and by the dialogue that occurs within its walls. To me, these really encapsulate what international development is from a Canadian perspective: acceptance, equality, and the celebration of diversity, culture, and ethnicity. It is amazing that this sort of dialogue can occur in one space with so many brilliant minds, who work tirelessly to support international development. I find inspiration in the events that AKFC holds at the Delegation, as experts and development professionals travel from all over the world to open up dialogue on a plethora of global issues. Farah Bundeali (FB): This is some of the most fun I’ve had! You inspire others, which only brings smiles. With simple steps, you can contribute to a great cause. You meet new people, you create new awareness, and the reward is when people start to ask to be involved. A Team Captain is a kind of ringleader—and you gain respect and credibility. It offers something different from your normal day job! AKFC: What has been your volunteer journey? What has your volunteer experience taught you? YN: My volunteer journey began with the inception in 1987 of “The Partnership Walk – for Third World Development” in Montreal. Over the last thirty years, my volunteer journey has taken me through various roles from being a member of the Organizing Committee to my current position as the Regional Donor Services Chair for Quebec and Maritimes. It has been said that, “blessed is the person, who plants a tree, not knowing if he will be there to enjoy its shade.” I’m truly blessed to have witnessed, from a humble beginning, how the Walk has grown in scope and stature and the difference it is making in improving the quality of life of marginalized populations in Asia and Africa. AF: My volunteer experiences have taught me to enter every possible situation I encounter with an open mind, as well as the willingness to listen. Since beginning work as a volunteer for AKFC, I have met a wide array of individuals, and from all of them I’ve gained a piece of knowledge or perspective. Whether I chat with a group of visitors to the Delegation during one of my tours, or occasionally chat with colleagues that work within AKFC, I have never left without having learned something new about development, the Delegation, or the global Ismaili community. FB: As a women and a leader [both for the Walk and in the business sector], I think the key challenges are to be heard and for people to take you seriously. Passion is often seen as “emotions” rather than a reflection of true reality. The key has been to be persistent and not give up. Your voice can be heard, and each time you speak louder. You often shy away from rejection or fear of rejection, but what I have learned is that if you don’t ask at least twice or more, you will not be heard. AKFC: What unique skills have you been able to develop as a result of your volunteer work? YN: Working with Donor Services team has enabled me to develop a number of skills sets including team building, managing/coaching volunteers, communication skills, event planning, and new web-based applications. AF: As a result of my work as a Visitor Program guide, I have become a better public speaker. I’ve given tours to large groups of people from all walks of life and levels of knowledge of the Delegation, as well as assisted at events with high-profile individuals from all over the world, including many ambassadors, diplomats, professors, and development experts. My communication skills have definitely benefited from such an opportunity. FB: Developing a team has been the biggest skill –motivating, inspiring and profiling people. People want encouragement, some level of motivation, and often have a “what’s in it for me” thought process, so profiling their role on the team at KPMG has created a lot of success in getting people to be involved and do more when they see it tied to recognition in addition to a personal cause. Working with people is critical to success, so you have to make sure you share that success. AKFC: What do you enjoy the most about being a volunteer? YN: [I most enjoy] being part of the AKFC family of volunteers and working with other talented and dedicated volunteers—and knowing that the work I do is important and appreciated. AF: What I most enjoy is the unique opportunity I am granted to educate and open dialogues about the building and the institutions it contains. I meet individuals and groups that may have little knowledge of the Delegation, AKFC, or the Aga Khan Development Network, and some who may have an extensive amount of knowledge. What I find fantastic is that in either situation I am able to participate in incredibly interesting conversation. My favourite part of the Delegation building would have to be the Char Bagh! The Char Bagh is a wonderful space for reflection and, from my perspective, it is a beautiful transition space between tours for visitors to enjoy the flora and fauna, the architecture of the Delegation, and discover the interesting twist behind the “missing” central fountain – an essential element in traditional Islamic gardens. FB: Meeting new people – you never realize what passion lies within your organization or the different people who you can connect with until you tie it back to a cause that has nothing to do with work! We all work for the same company, but we may never have met. A common cause, a common goal, a common passion has created new relationships and has allowed us to extend our relationships beyond those we see each day. That is a true achievement when you work for an organization with over 5,000 employees. AKFC: What would your advice be to someone considering becoming a volunteer—or for businesses considering supporting volunteer opportunities such as Walk Workplace teams? YN: Get involved and serve with passion and intensity. As a member of the Donor Services team, you are in a position of trust. Discharge your responsibility with integrity and professionalism expected by our donors. AF: My advice to someone considering becoming a Visitor Program guide is that you should be prepared to learn. A lot. What I cannot stress enough is the number and complexity of topics you will covered in tours and events at the Delegation. At the end of the day, you will almost always leave any tour or event hungry for more knowledge or conversation. I find that very exciting and motivating. FB: I think businesses need to understand their connectivity to the world. Often we focus too closely on the people next to us. What is happening globally is important, and the impact we can have on these issues has a direct connection back to us here in Canada. We are not immune to the issues in other parts of the world, and businesses need to see that global connectivity. Clearly, there is personal satisfaction for everyone involved to “do good” and make a difference in the world. However, there is more, because as a business, we have been able to create engagement with our colleagues. We have been able to bring our people together and enable them to focus on something a greater shared goal that goes beyond the work of our company. We have created global citizens and inspired in them the desire to do more given all the opportunities we have [in Canada]. AKFC: What’s been your best experience, or most memorable moment, as a volunteer? YN: I have two memorable moments. In 1994, Princess Zahra Aga Khan graced us with her presence at the World Partnership Walk in Montreal. Organizing the first Donor Services Volunteers Appreciation event in Montreal was another experience that I shall remember. It was a great source of motivation to see the silent workers recognized and awarded certificates for their years of hard work and dedication. AF: My best experiences as an AKFC volunteer would have to be assisting at the events held at the Delegation. I find them great opportunities to learn. As a student at the University of Ottawa completing a degree in communications and minoring in law, I always draw inspiration from the experts that come to speak, as I hope to pursue a career in development myself. A memorable moment? There have been far too many! FB: My proudest moments have been when diverse Canadians from our organization not only stepped up to participate, but asked to lead as individual city Team Captains. They saw how much more [meaningful] the Walk was than a single event and brought new ideas, fresh thoughts, and wider participation. Our numbers grew, the profile of this event grew, and today, the level of engagement is wonderful across the firm! Inspired by our volunteers to get involved with AKFC for Canada’s 150th? Learn more here.